I must begin this particular review with a confession. I’m not certain I would have purchased this book myself but, after reading it, I’m thankful and proud to have it occupy a special spot in my personal library. I received this collection of morality tales as a Christmas gift from a dear, long-time friend and began reading it more out of obligation than desire or interest. I’m pretty sure that approach stemmed from my dislike and distrust of most anyone involved in today’s political climate … from dedicated liberals to devout conservatives. However, I must also admit that if I were to be in the least tempted to read anything written by a politician, it would be the works of John McCain. He is one of the few politicians I admire for his courage to speak his mind and do what he thinks is right for the American public. He cares little for the approval of his own party and has an equal number of friends and foes on both sides of the political aisle. Few others can make that same claim and probably fewer have the courage to want to. He is a rare exception to the partisan bitterness in Washington these days, often crafting bipartisan approaches to issues such as smoking and campaign reform. John McCain is a maverick senator and former Vietnam veteran and prisoner of war. The son and grandson of prominent Navy admirals, John McCain was born in the Panama Canal Zone in 1936. After graduating from the United States Naval Academy in 1958, McCain began a 22-year career as a naval aviator. In 1967, he was shot down while on a bombing run over Vietnam. He parachuted into a lake, breaking both arms and a leg. He was held as a prisoner-of-war in Hanoi for five and a half years (1967-1973), much of it in solitary confinement. He actually refused early release—which he saw as a public relations stunt by his captors—insisting that POWs held longer than him should be granted their freedom first. To me, that act alone speaks volumes of John McCain’s character! Thereafter, McCain was treated much more severely, but he also had an opportunity to bond with his fellow prisoners. Those experiences strengthened his resolve and eased his transition back into civilian life. He retired from the Navy as a captain in 1981. McCain’s naval honors include the Silver Star, Bronze Star, Legion of Merit, Purple Heart and Distinguished Flying Cross. 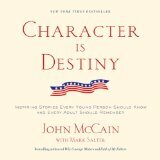 In Character Is Destiny, McCain and Salter tell the stories of 34 celebrated historical figures and lesser known heroes whose values exemplify the best of the human spirit. He illustrates these qualities with moving stories of triumph against the odds, righteousness in the face of iniquity, hope in adversity, and sacrifices for a cause greater than self-interest. Each area of this book is titled with a general value. For example, part one is titled with the general value honor. Each individual value has specific character traits that make up that particular value. For instance, honor includes similar areas such as: honesty, respect, authenticity, loyalty, dignity. Then, the authors share a true story of a person who exemplifies the featured value. Each of the stories exemplifying character traits is well-told, beginning with a brief summary about the person. Each subject area features a cover page consisting of an impressive hand-drawn portrait of the person who is profiled. In addition to the portrait is an insightful quotation from a William Shakespeare play. His choice of heroes and heroines is diverse enough to please both liberals and conservatives. I think he pretty much says it all in his subtitles. These are indeed stories which should be shared by both young people as well as adults as it is a genuine celebration of the human spirit. The 25 men and nine women featured in this stimulating collection include: Gandhi, Joan of Arc, Winston Churchill, John Wooden, Abe Lincoln, Nelson Mandela, Wilma Rudolph, Mark Twain, Mother Teresa, and Tecumseh to name just a few. You’ll also learn about the Catholic priest in Auschwitz who offered to take a condemned man’s place; the 66-year-old British Prime Minister who, in a renowned eighteen-word remark that would live forever in annals of history, counseled schoolboys to “never give up”; a nun, formerly a comfortable Beverly Hills housewife, who works with prisoners in Mexico’s worst jails; and the 27-year-old football player whose love of country led him to turn down a three-year, $3.6 million contract with the Arizona Cardinals of the National Football League to enlist in the Army shortly after 9/11 and then make the “ultimate sacrifice” in Afghanistan. This collection will provide you with hours of enjoyable reading, thought-provoking examination, and cherished inspiration.